For me, the subject of Civilization enthrals more than simple cityscapes and skylines. While I am mostly out in nature to take my pictures, often I am confronted with the imprints humans leave in their surroundings. And it not only encompasses buildings and streets, but also the humans themselves. When caught in their environment, they may never notice that they are being photographed. Yes, this category also includes street photography, a subject that I have yet to tackle. Sometimes, I get lucky. I'm somewhere and I totally don't expect to take a great picture, and then it just happens. I was inside the Vancouver Science World building, with its large glass windows overlooking False Creek, watching my son play with the water feature when I saw this scene... I had to take the picture without tripod, through the glass, and I had to do quite a bit of retouching, but in the end, I was proud of the result. In my head, this is exactly what the scene looked like. And it is the reason why I took the picture. 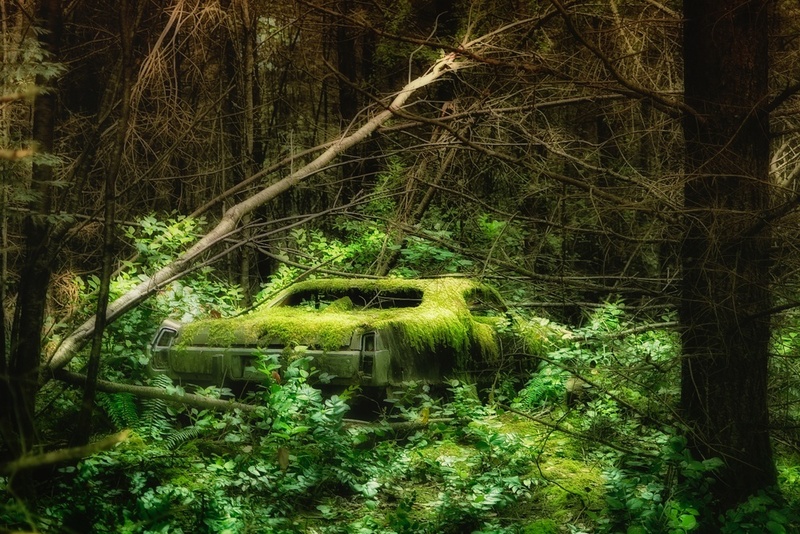 On a Flickr Meet with some online friends, we stumbled across the most amazing find on Gabriola Island: an abandoned car. Not only was it abandoned, but it was completely overgrown by moss. There were trees around it, and behind it, that must have grown there after the card had been left. The picture was hurried and not very well lit. With some photoshop tricks, I was able to bring out the mysteriousness of the find. Whenever I can, I fly to Germany to visit my family there. My parents live in a small town in the southern part of the country, and from there a lot of beautiful places are an easy car drive away. On a recent visit to Rothenburg ob der Tauber I spotted this restaurant in the late afternoon sun. The time seems to stand still in this small, beautiful town. It was in 2010 when the Olympic Winter games came to Vancouver. The city was overflowing with tourists - people from all parts of the world, masses and masses of people all piling up in the center of town. Only over the water, there was calm. When I took the picture, thousands of people were behind me, but in front of me, only calm and quiet. In a small town of Rothenburg ob der Tauber in southern Germany, the old times mix with the new. The streets are cobble stones, and the cars are parked as far up the small sidewalk as possible to make room for the horse carriages. Tourists are swarming the town, but the locals still need to live there. Although the old days have their charm, we don't want to live without running water, right? At a trip to a large local shopping mall, I was able to catch some of the action at a level below. I am a very hesitant street shooter, but taking a picture from above made me and the subjects feel at ease - me, because I knew they wouldn't look up, and them because they didn't know their picture was being taken!